How modern home design is taking the fiction out of sci-fi. It seems difficult to imagine living our lives without access to the internet. Much in the same way that people depend on the internet, so do smart homes and the devices in them. Many experts refer to this as the “Internet of Things”, or the network of devices, appliances, and features that we operate with wireless, mobile and voice controls to create a smart home. The most basic prerequisite for a smart home is a solid internet connection and very good in-home Wi-Fi. Sticking a router in your laundry room and hoping for the best simply doesn’t cut it anymore because every device, from surveillance cameras to thermostats, needs to live on the network if it is going to be integrated into the home. The network structure in today’s smart homes typically consists of enterprise class networking equipment including several strategically placed Wireless Access Points (WAPs) to ensure that the whole home is blanketed in solid Wi-Fi coverage. A lighting control system is an intelligent and usually network-based system of controlling the lights, both natural and artificial, in any given building or space. Simply put, think multi-button switches that can turn on and off the entire house from the front door and single keypads that replace 6 or more switches to eliminate ugly wall clutter. Combine that with some creative programming and cloud computing and you have smart lighting systems that turn on and off given areas based on daylight, whether or not you are home, and can automatically adjust for the change in sunrise and sunset for the time of year. Many systems are even smart enough to know whether or not you’re home in order to maximize energy savings or give the illusion that people are home by turning on and off lights. Integrating shades into a smart home system creates the ability to harness natural daylight and maximize it. This also creates convenience with the ability to operate multiple shades at once or integrate them with lighting control scenes for added ambiance. Given the options available today for window treatments and smart home products alike, it’s important for consumers to choose manufacturers that are known for reliability and workmanship. 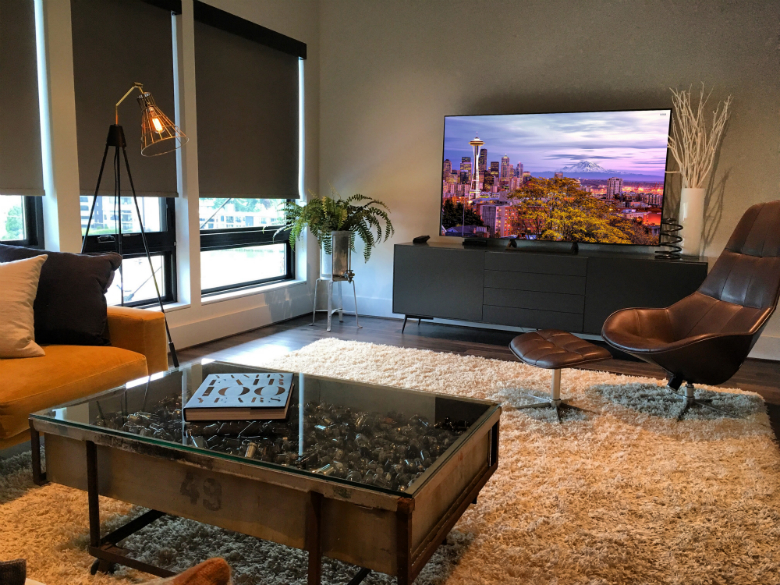 Wipliance is the largest area dealer of Lutron shades, and chose to partner with Lutron because of their unmatched 7-year warranty, nearly silent motor operation, and the ability to integrate with all leading home automation platforms. Multi-room audio systems are more popular than ever, and integrated speakers, or at least pre-wiring for them, has almost become a standard feature in high-end homes. One of the biggest complaints we hear from customers is when a luxury home lacks this feature and the homeowner is forced to pay for an expensive retrofit. With distributed audio it’s important to use a solution that can support all of the audio sources you store your library in, whether its Pandora, Spotify, Apple or Amazon Music, or even your local music library. Home owners want to be able to access all of this at their fingertips and to easily send the audio to any room in the house at varying volumes. With an increasing amount of digital content being produced and distributed directly to the living room by firms like Netflix and Amazon, it becomes difficult to pick and choose what you want to see in the theaters on special occasions. Additionally, movies are being released to video more quickly, making a high-end theater or media room in the home extra enticing. Manufacturers like Sony have made great leaps in their home media technology and are now offering large format 4k televisions and projectors, as well as the 13-speaker Dolby Atmos surround sound systems, once reserved for dedicated movie theaters, to home consumers at more affordable prices. Security is more important than ever, and people want peace of mind that their families and homes are safe. Today’s security systems take a two-tiered approach that includes a traditional security system that will alert authorities in the event of a break in, fire, or other disaster, as well as smart surveillance systems. Today’s surveillance systems are able to send intelligent notifications, such as differentiating between your babysitter or housekeeper vs. a stranger, in order to minimize false alarms so that when you do get an alert you are less likely to ignore it. We’ve seen the videos of package thieves ruining Christmas and because of the rise in e-commerce in the last decade this type of crime is at a record high. This has inspired a number of companies to provide sophisticated intrusion and access control systems. With a video doorbell and smart lock, you can see who is at your front door and then grant access remotely in the event you aren’t home. Many smart locks even offer code schedules, so that your nanny or cleaner’s code only works when they’re scheduled to be there, or so your cousin, who is crashing in your guest bedroom, can’t overstay his welcome. With the recent advances in digital personal assistants such as Alexa, Siri, Cortana and Google Home, voice control is a new and exciting way to interact with the home. Though we never like to eliminate standard controls in favor of voice, using voice commands to control the home is a great way to add convenience and utility to the smart home experience. Voice commands are great for triggering scenes such as “Privacy Mode”, where all shades are lowered, or “Party Mode”, where the lighting is set to ambient and the music begins to play, both of which are very popular requests among homeowners. Other useful commands include “Welcome Home” and “Goodbye” scenes that effectively turn on the house or lock it down. Rising trends toward dual income families is leaving an increasing number of homes empty during the day. Power couples and single homeowners alike want to be able to keep an eye on their homes and control them remotely. Whether it’s checking in on the alarm or surveillance to make sure everything is okay, opening the door for your house sitter, or turning on the TV for your out-of-town guests, there are solutions to facilitate. Forgot to close the garage door? No problem. Tying the whole home together and making it ‘smart’ does a lot more than add convenience. When lighting control, shades, and automation systems are combined with a smart thermostat the house can begin to regulate itself and practically come alive. Occupancy sensors can tell the home when its absent of people in order to put the home in an energy saving state, even if it wasn’t turned off before the last person left. Shades can be programmed to read the weather and block sunlight to keep temperatures down in the summer or let more in to help warm the home the winter, which takes the load off the HVAC system and lowers energy consumption. Smart thermostats adapt to the homeowner’s schedules and learn when to start heating or cooling the home in order to minimize energy usage without compromising comfort. Whether it’s the environment you’re worried about or your bottom line, this is a good thing. With all of the products and solutions available for a smart home, it can be challenging to create a system that is both feature-rich and easy to operate. The key to achieving this is to partner with a team of experts in home automation who understand the needs and goals of the homeowners. At Wipliance, one of our core mantras is “simple, scalable, solutions” to create the ideal smart home ecosystem that fits with your unique lifestyle.